Why Can't Anything Be Easy????? Let's go back to my niece Miriam's home, and see what I've been up to!!!! 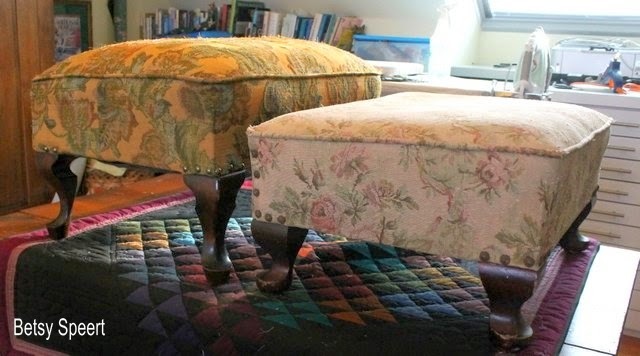 I was trying to find an ottoman that matched the one on the right. My first attempt was STOOPID!!!!! I made a rookie's mistake, and forget to check the dimensions before I had Miriam buy it. I found the one on the right on eBay. I wanted a 1930's style. 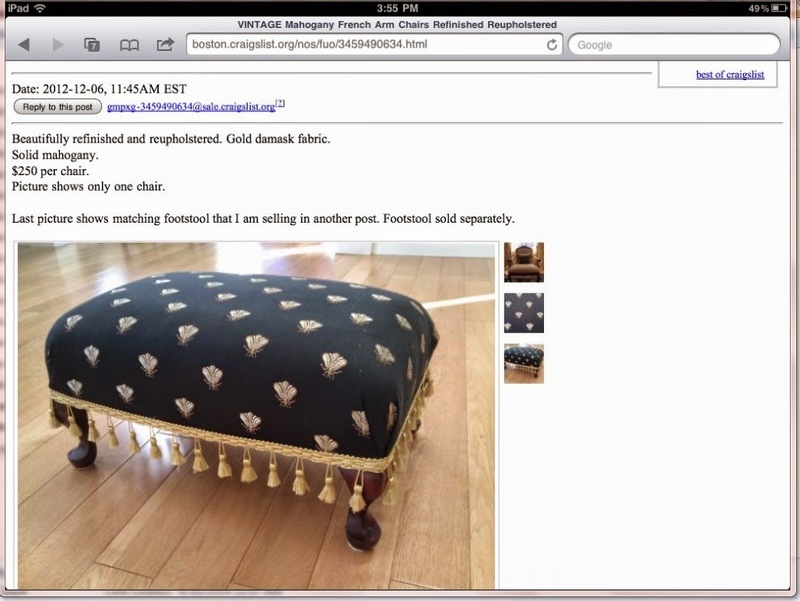 I found it on Craig's List. They just had their baby, so I hope they're too busy to read this post!!!!! So this is the best I could find. The width and depth were almost the same as the first one. I didn't want to have to drive an hour out to Worcester, which is in western Massachusetts, so I arranged to meet the seller at her dentist's office in Brookline which is just outside of Boston. all for my niece Miriam. and was 20 minutes late. But the ladies behind the check in desk were very nice, and even let me use the rest room!!!!! 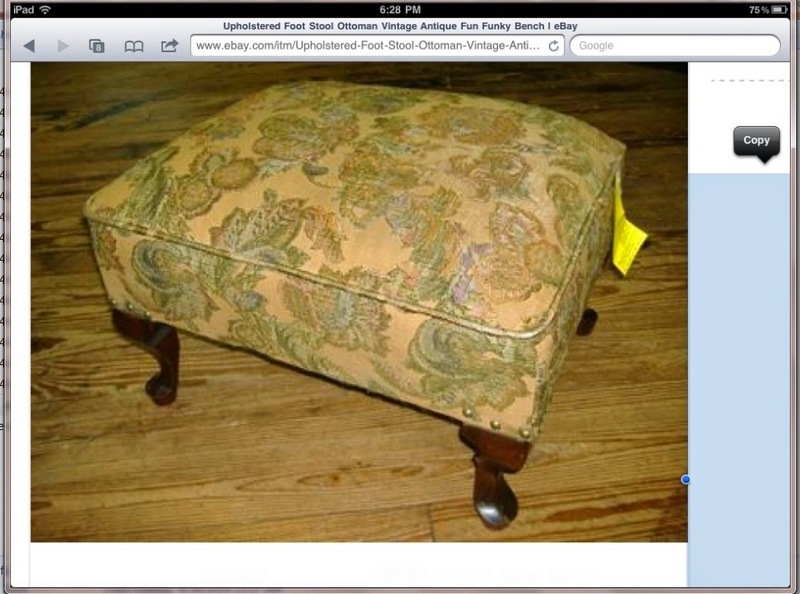 The new footstool wasn't as tall as the first one, but I figured I could resolve that in the reupholstering. The legs were a little different. But I told Miriam that that just made it more interesting!!!!! She believes anything I tell her!!!!! here they are, side by side in my workroom. They are both from the 1930's, however, with the slightly different leg styles, there was a 1.5" difference in height. Before I stripped them, I took some pictures of how they had been done, so that if I got confused, I would have something to refer to. My upholstery teacher, told us to always take detail pictures. 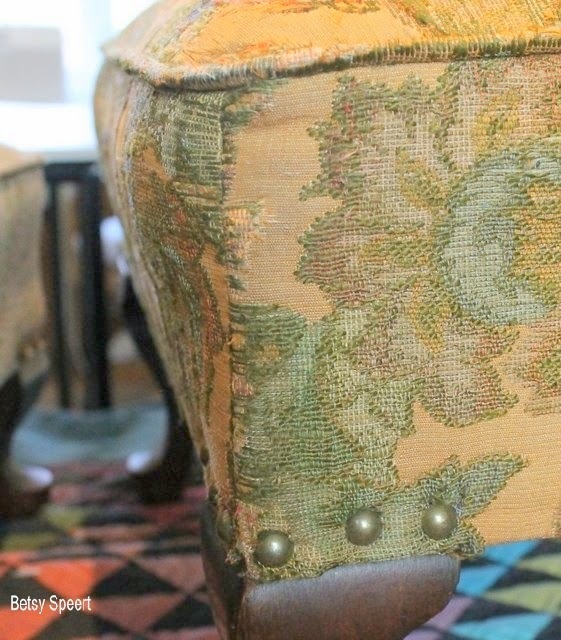 The corners were hand stitched closed. I would never have know to do that. I would have sewn the whole piece together, and then cried when I couldn't get it on properly. that's what my project was. Next post I will show you how I made these things look somewhat the same. 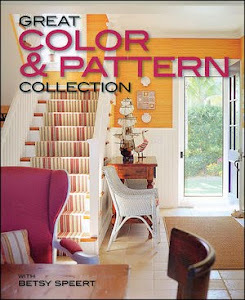 I will show you how GREAT they look in Miriam's living room. I've been in the throes of a creative frenzy. and can't focus on anything else. 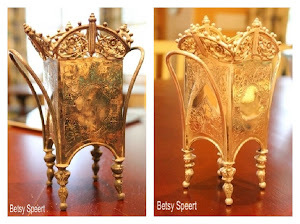 I become obsessed with whatever design project has caught my interest. 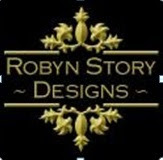 Next year I plan on launching a fabric line that will be available at Studio 534 in the Boston Design Center. I will be doing this with Josh, who owns the showroom. He want's to do it next year. I have gotten off my lazy @$$ and started designing. and a whole lotta style. back to the cottage on the Cape. I will next show you guys the deck that overlooked the ocean. It's overlooking lots of water!!!!! I had slipcovers made for my outdoor cushions. They slipped over the outdoor fabric that was already on them. It was just a boring white, and I wanted something more colorful for the pictures and for parties. This is in the days when I actually had parties. 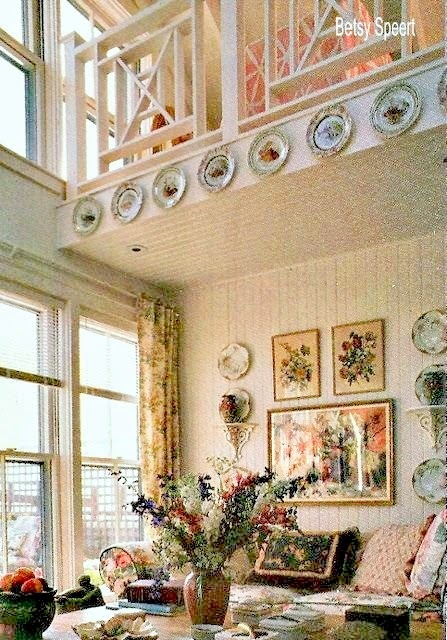 Way back in the dark ages, when I decorated this cottage, there wasn't anything available in outdoor fabric other than plain simple colors and stripes. That's why I used the indoor fabric for the outdoors. Nowadays there's tons of stuff to choose from. 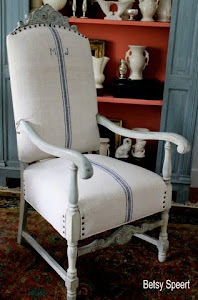 The fabric I used was the same one I put on the cushions for the Pier 1 wicker lounge chairs.. While rummaging through several salvage yards, looking for things for the renovation of this house, I found the trio of concrete pelican figurines. hauled them around to my different homes. and I now have them by my pool in Flerida. They keep me company and are my life guards in my 66" deep pool. Over by the dining area is my grill. I made it out of an old egg crate. An egg crate is a pottery container that was used to transport 100 year old eggs, and were the Chinese equivalent of cardboard containers. I used to pick them up in China Town in Boston. The grocery stores gave them away. You had to time it right, to go by the store when the pot was empty. After a while, the merchants got savvy, and started selling them for a nominal fee. But I still had to time it to buy them when they were almost empty,. Century egg or pidan (Chinese: 皮蛋; pinyin: pídàn), also known as preserved egg, hundred-year egg, thousand-year egg, thousand-year-old egg, andmillennium egg, is a Chinese cuisine ingredient made by preserving duck, chicken or quail eggs in a mixture of clay, ash, salt, quicklime, and rice hulls for several weeks to several months, depending on the method of processing. Through the process, the yolk becomes a dark green to grey colour, with a creamy consistency and an odor of sulphur and ammonia, while the white becomes a dark brown, translucent jelly with salty or little flavour. The transforming agent in the century egg is its alkaline material, which gradually raises the pH of the egg to around 9–12, or more during the curing process. This chemical process breaks down some of the complex, flavorless proteins and fats, which produces a variety of smaller flavorful compounds. Today, while looking up stuff about these eggs, bopping around the internet... I found this YouTube video. you may want to click on it for some amusing info!!!! 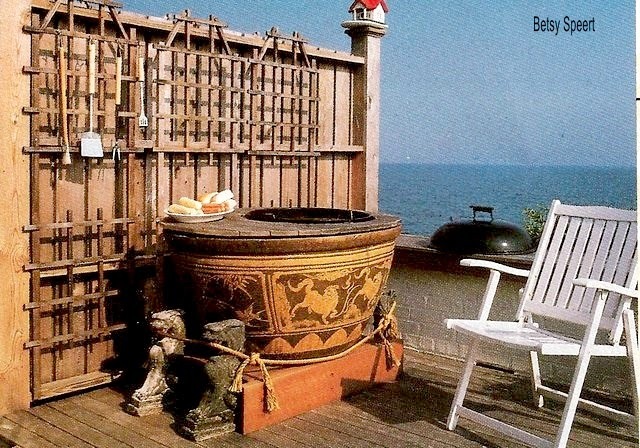 The pot for my grill was oval and larger than average, I bought it in an antique store. I had never seen one this size or shape, so I had to have it. I figured that I would think of something to use if for, once I bought it. Luckily I was able to come up with a place to put it. I had a wooden top made to fit over the lip of the pot, with a hole cut out to hold the grill. I wanted it to be higher, for easier cooking, so I designed a frame work that bracketed some gargles that I picked up at the same place I found the pelicans. Then for added flair, I tied it all together with a big hemp rope. They turned out to be a great place to hang my barbecue tools. I will try not to have such a gap before my next post. 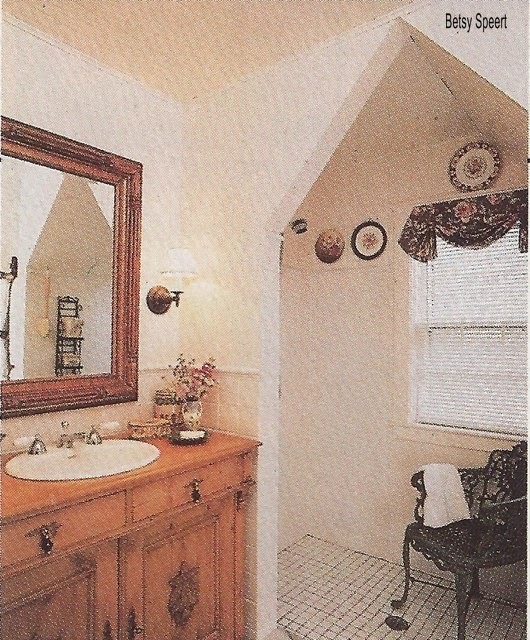 When I bought my cottage in Dennis Port on Cape Cod, the bathroom was off the kitchen. Which meant you had to go through the kitchen to get to the bathroom. Which meant that you had to walk a ways in the middle of the night to get to the bathroom. So I redesigned the house, so the bathroom door was by the bedrooms. I will be showing you guys the floorplans in a bit. After I finish showing all the pictures. The house originally had three bedrooms. 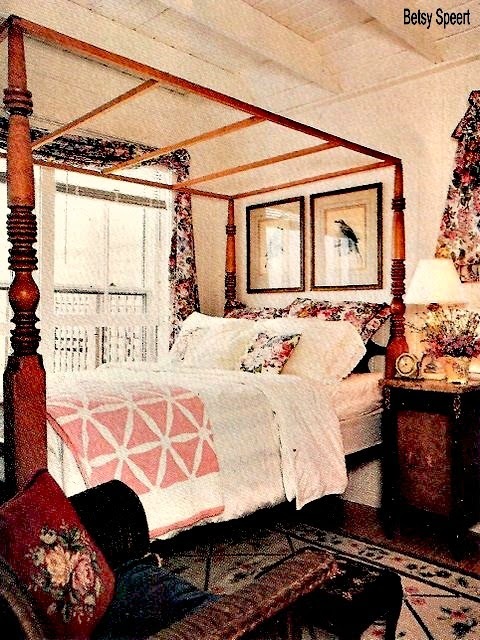 One was so small that you had to enter it sideways to fit in the room with a twin bed. I don't mind a small room, but walking sideways is taking it beyond quaint. So, I removed the third bedroom, made the second one a little larger, and created a bathroom that also had a stacked washer/dryer. Across from the sink was the toilet and closet with the washer and dryer. Boy do I wish this was the days of digital cameras!!!!! I have nothing to show you. I found an old frame that I painted gold, and waxed with dark wax, and then had the mirror added. Since I didn't have a medicine cabinet, I had the drawers in the server rebuilt, so that they were able to fit around the sink, by keeping the front but reworking the box of the drawer. On either side of the mirror, I installed a pair of vintage looking aged brass sconces with white linen shades. I clad the room in beadboard, and used simple white 4 X 4 glazed tile for the backsplash around the sink, as well as inside the shower. 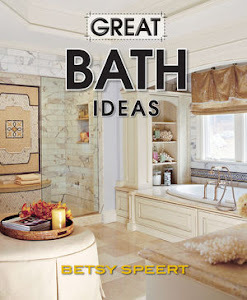 I repeated the slant in the opening to the shower, creating a peaked entrance. 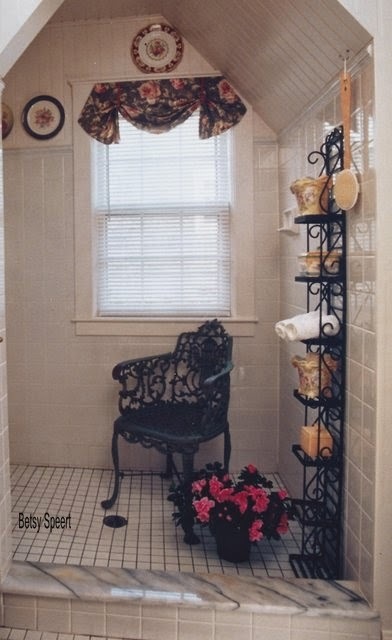 I hung the shower curtain on hooks installed on the wall inside the stall that separates the sink from the wet room. 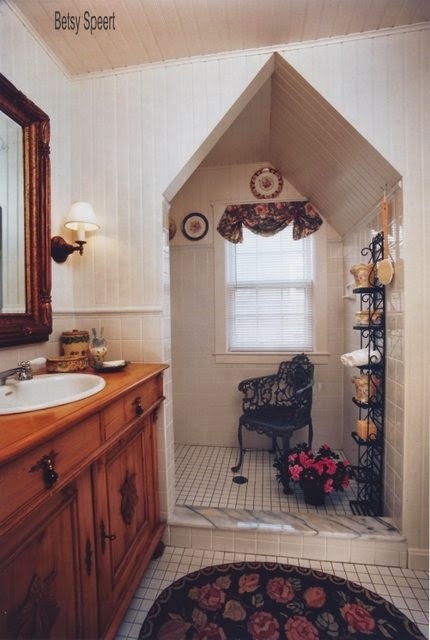 I always like a place to sit or a ledge to place my leg in a shower. Since there was not such a place, but plenty of room, I plunked down an iron garden chair. Not the smartest idea, as it rusted onto the white tile floor. Probably saw it in a catalog. On the window, I repeated the simple treatment that I had used elsewhere in the cottage. 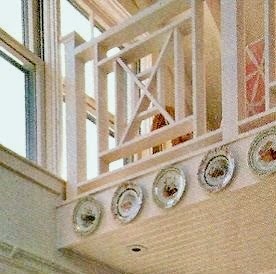 For artwork, I hung plates on the wall, as they were impervious to the dampness in the room. There's always room for more plates on the wall!!!!! That's my Cape Cod bathroom. I hope you all had a wonderful Passover and Easter. I celebrated by myself in lots of peace and quiet. I'm very excited that Orphan Black is back on TV. On an even different note!!!!! I AM SO HAPPY THAT JOFFREY IS DEAD!!!!! HE WAS SUCH A CREEP!!!!! Sooooooo....., I'll finish right here. let's continue with looking at my leetle bitty house on Cape Cod. On Wednesday I showed you guys the master bedroom. 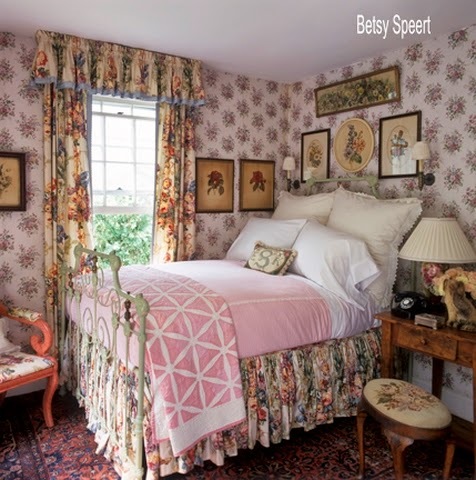 Today we'll look at the guest room and finish up with some pithy points about the master suite. 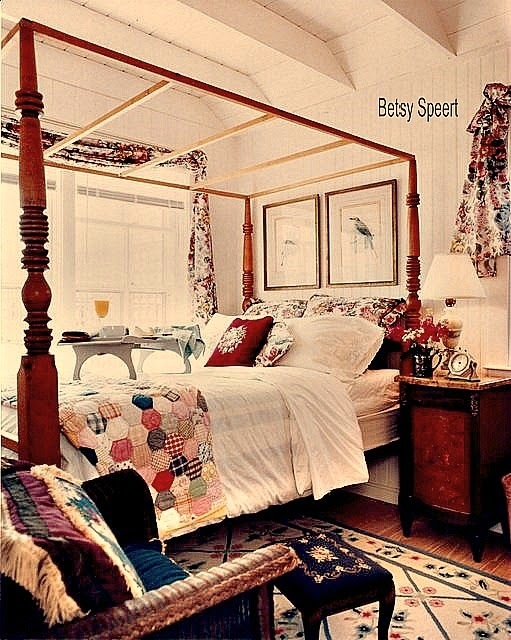 I wanted to have a pair of twin beds in the guest room to allow for more options for entertaining company. I liked patterned ones with flowers on them. I think I got these there. 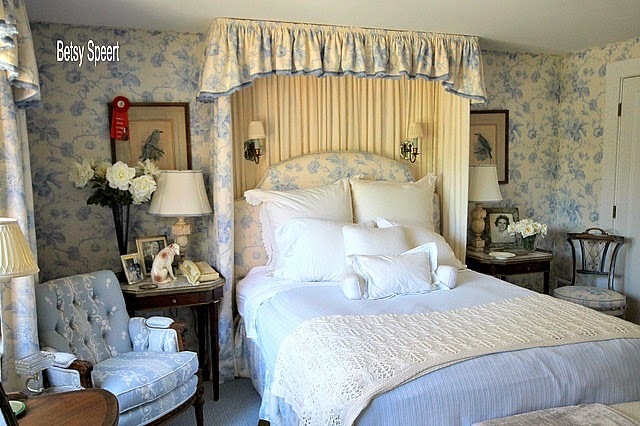 Since the walls were white beadboard I crammed a lot of pattern onto the beds. 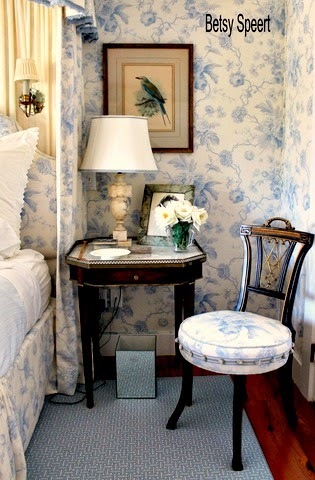 I repeated the floral motif on the toss pillows, lamp shade and framed prints. 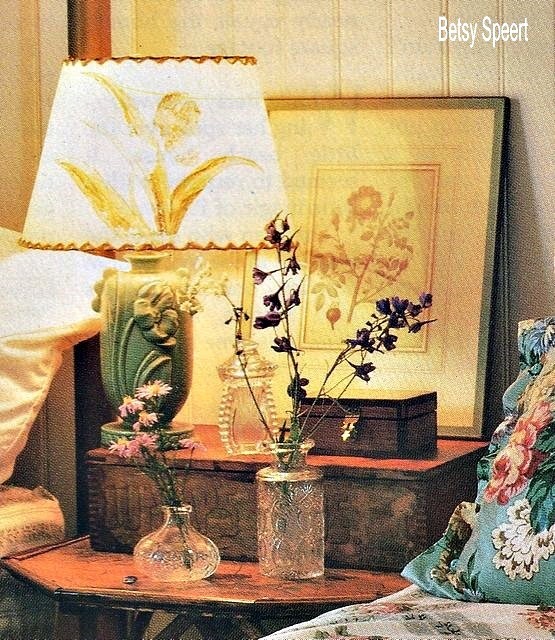 I love this little lamp with the floral shade, and still have it. I never know when it may come in handy!!!!! It wasn't tall enough to sit on the table between the beds, so I set it on an old wooden box. Lots of times, I want to use a lamp that's a little on the short side. I place them on stacked books and all sorts of things to give them extra height. rather that bang another nail in the house. Old perfume bottles can make nice bud vases, and that's how I used them here. These are inexpensive pressed glass ones, rather than the more expensive cut crystal. 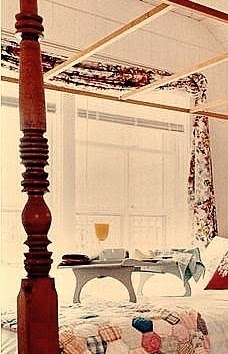 Neither of the bedrooms had closets, so I bought English pine antique armoires that came apart into pieces. so we were able to get them around some tight corners and into the rooms. I wish this was in the days of digital cameras. I would have had pictures of everything!!!!! Back in the late 1980's and 1990's, dhurrie rugs were all the rage. I used one in the living room and one in both bedrooms. The one above pulled the blue and pink colors out of the fabrics, repeating the floral motif. and hung them from nails in the corners of the windows. 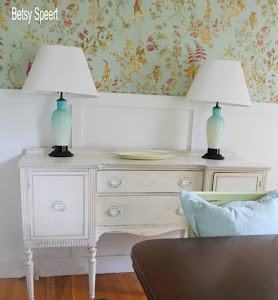 I like the look of a bare tester, it can add some architectural detail to a room. 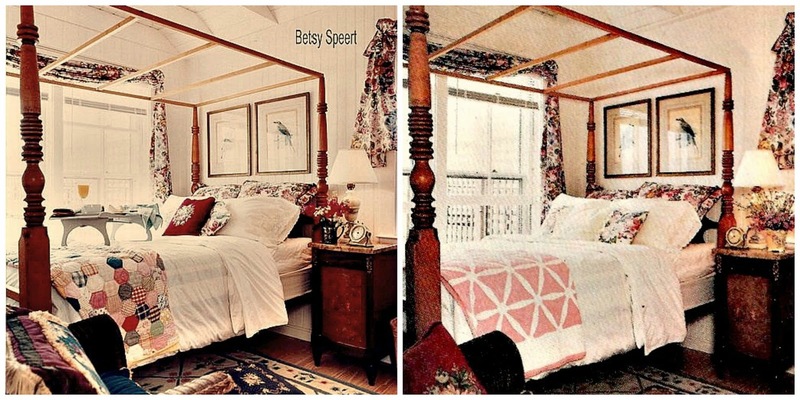 Canopy beds don't have to always have fabric on them. Just showing the structure can be pretty. 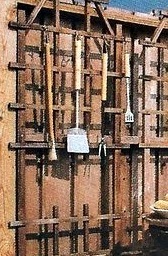 wall that held the armoire. I found a wonderful old desk clock that didn't work. It looked pretty, and that's all that mattered!!!!! look at your clock radio, it's right by the pretty antique one that doesn't work. 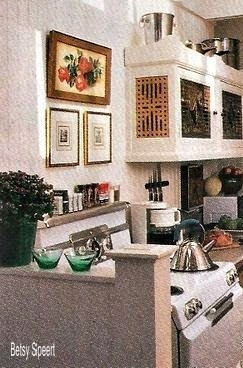 Of course, for the magazine shoot, we moved the clock radio out of the picture!!!!! On the night table I placed an old 1930's alabaster lamp. I have a pair next to my bed in Massachusetts. these are very tiny rooms. Now that I've shown you all the living room and kitchen of my tiny leetle cottage on Cape Cod, let's go into the bedrooms. There were two in this palatial retreat. A master and a guest room. You could barely turn around in either one. First....THE MASTER BEDROOM IN ALL IT'S MASSIVE GLORY!!!!! 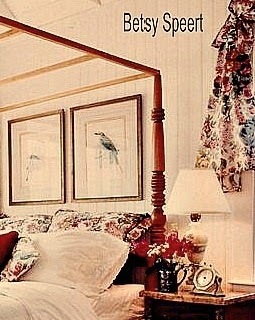 you may remember the bird prints over the bed. 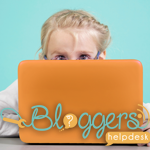 as I am writing this pithy post!!!!! All this crap stuff, just gets moved around. I needed to use it in the photo shoot, because I had to stage it differently for the two magazines that were shooting it that day. The other way it was shot was like this, here, in the following picture!!! This was the way I actually had the room. I loved the multicolored quilt that I found in an antique store on route 6 in Dennis. I even reused the purple pillow. and having finials made that I glued my wooden black forest bears to. 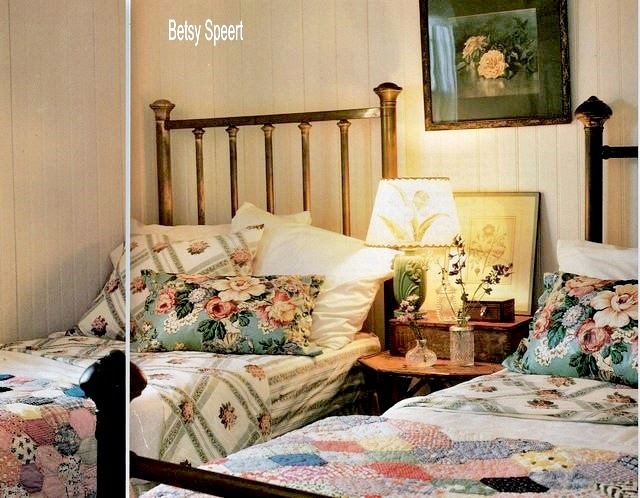 So this is how you can change up a room a little for a photo shoot. The quilt was different as I said. 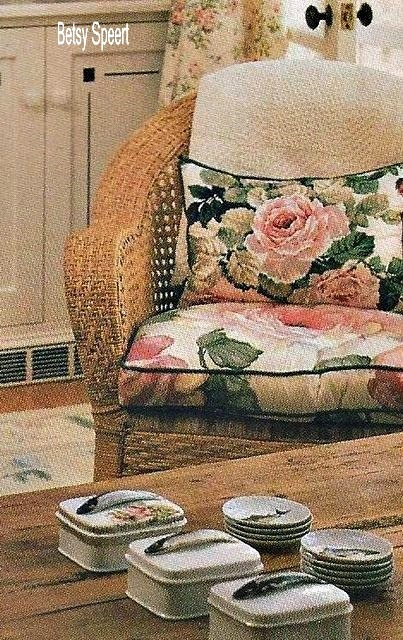 The red needlepoint pillow was moved from the bed to the chair. The pillows on the bed were different. 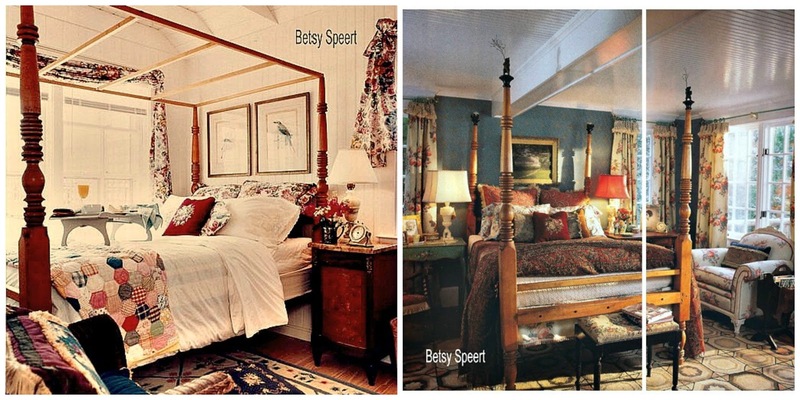 The shot on the left had the 1930's collapsible bed tray set up with orange juice and other breakfasty things. The flowers were different, and the container holding them was different. This is like one of those games, where you have to find what's different!!!!! but my shoulders are starting to cramp up because I type at a table that looks good, but is too high. So much for form following function. I am not always practical. Anyway, it's dinner time, and you know how I get when I'm hungry. 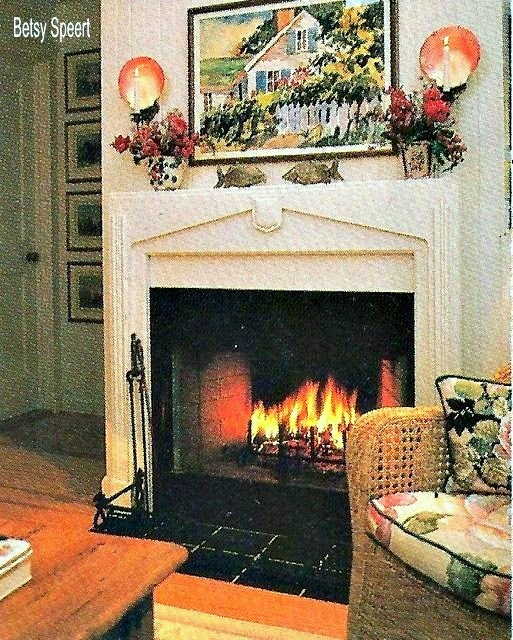 When I renovated my teeny tiny hovel on the Cape, I decided that a fireplace would be just the ticket!!!!! As I told you guys in a previous post, I scoured different salvage yards to find things for this project. where can I stick this??????? that is what happened when I found this mantel. 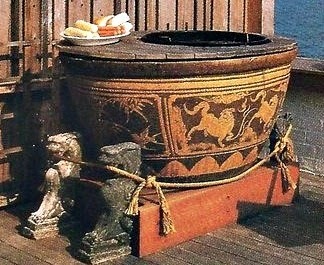 It is a Tudor style, probably from a house built in the early part of the 20th century. It was dark stained wood when I found it. 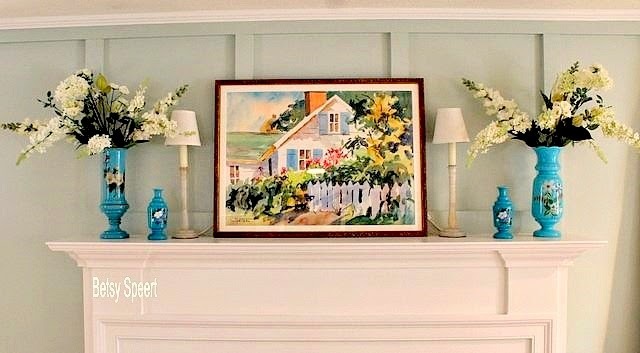 I thought that painting it white would transform it and give it more of a beachy cottage feel. 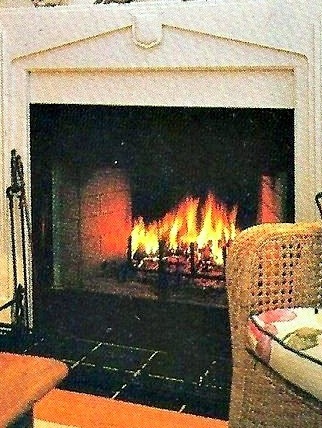 I tucked it into the wall that backs up to the kitchen and bathroom, enabling me to create a seating grouping that was centered on the hearth. 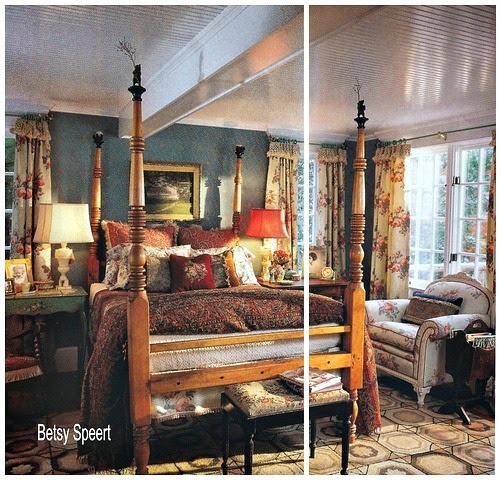 Since I had two different magazines publish this house, we had to style it differently for each one, although we shot them both on the same day. For The Boston Globe Magazine, we shot it way I usually had it. The pair of silver fishes are actually some kind of place card or menu holder as they have slots in the tops of their backs. 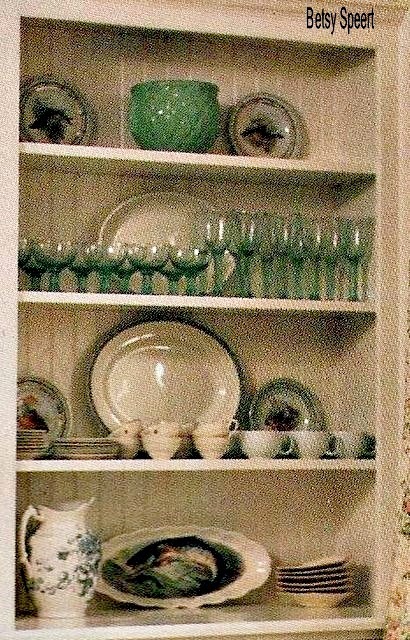 For Decorating Magazine, we used the set of china coasters I had, and set them in a row along the mantel shelf. We also changed the plants in the mismatched cache-pots. I like to use things that are mismatched. I think it keeps designs from looking too set and staged. The candle holders on either side of the picture were wonderful as they also held plates. The plates I used were part of a set of pink shell dishes that were a gift from my sister-in-law, Faye. 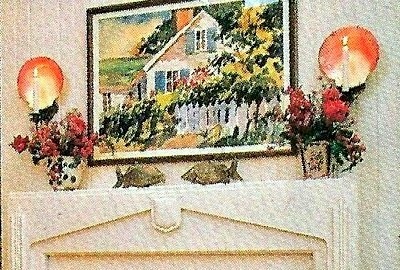 The watercolor was painted by the same artist that did the picture over the sofa. I had it framed with glass that was non-reflective and filtered out the harmful rays of the sun. I gave it to my niece Miriam and her hubby Ross for their living room. When I designed this fireplace, I wanted it to look as traditional as possible, even though I was using a modern fireplace insert. These inserts have a raised firebox, and I did not want to do a raised hearth. and for another, there was no room in the floorplan. I did what I always do!!!!! I clad the face of the metal box with smooth black slate, and treated it with a traditional hearth. Using a black facade with no sheen, creates the illusion of the firebox being part of the whole unit, not floating off the floor like it does when people clad these boxes with a lighter material like marble or lime stone. To the right of the fireplace is the kitchen. I separated it from the living room with a half wall that terminated in newel posts. 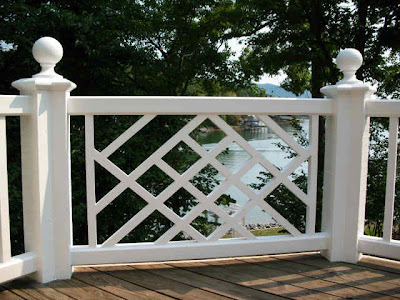 The posts were the same style as the ones I had built for the railing on the loft. The amount of conversation that was required with the builder to get him to make the simple posts was really annoying. Who knew I would end up dating him????? 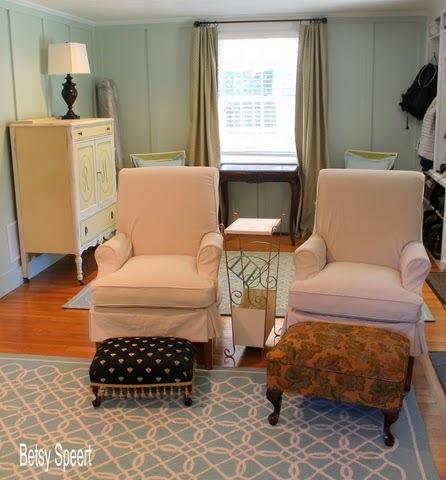 I completely renovated/changed/redid the cottage I bought on Cape Code. That included raising the roof to create a loft where I set up my office/drafting board. In future posts, I will show you the old and new floorplans as well as construction photos. 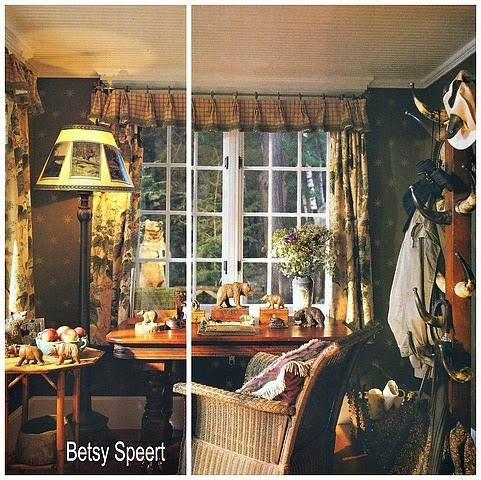 But for now I'm just showing the after shots that were published in Decorating Magazine as well as the Design Magazine of the Boston Globe. The loft looked over the living room and the new fireplace I added. 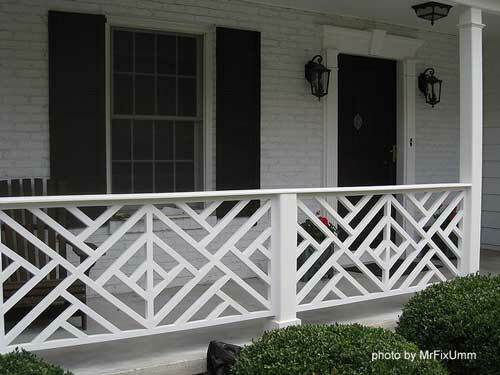 I drove around the Boston area looking for railing ideas, nearly driving off the road in several instances while I craned my neck trying to absorb architectural details. 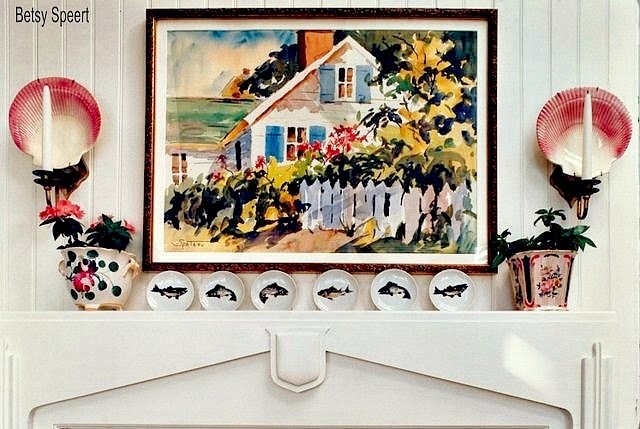 I wanted the cottage look as well as a feel of New England. I settled on the Chippendale style. and it's all spread out for you in the comfort of your living room!!!!! This is the pattern I chose. 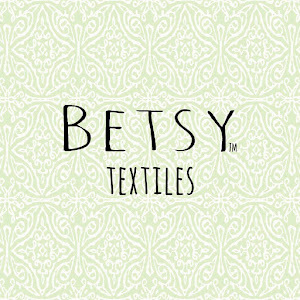 But there are tons of wonderful patterns to choose in this style. 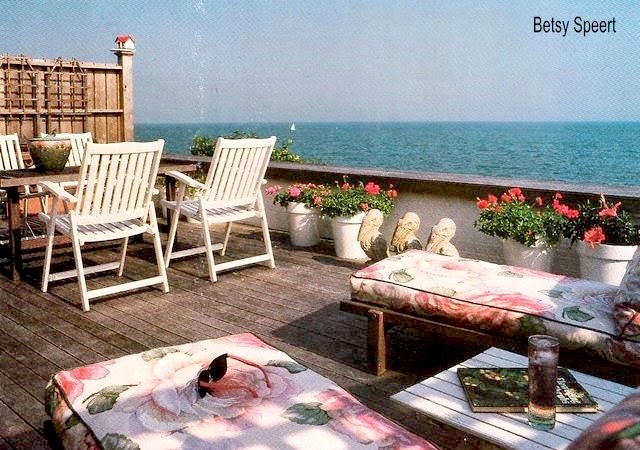 The loft looked out over the ocean. When I was sitting down upstairs in my desk chair, I couldn't see any land, just the water. It felt like I was in a boat!!!! 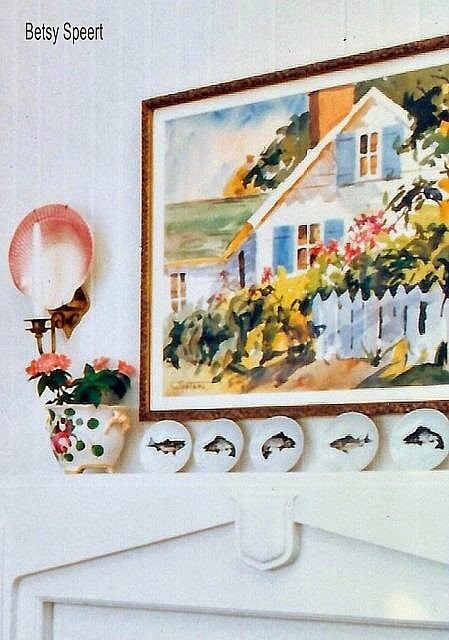 Along the front of the loft I hung a collection of fish plates. people had special plates for the different courses of a meal. For the fish course, they had a set of plates with different fish hand painted on each plate, as well as a platter to match the set. 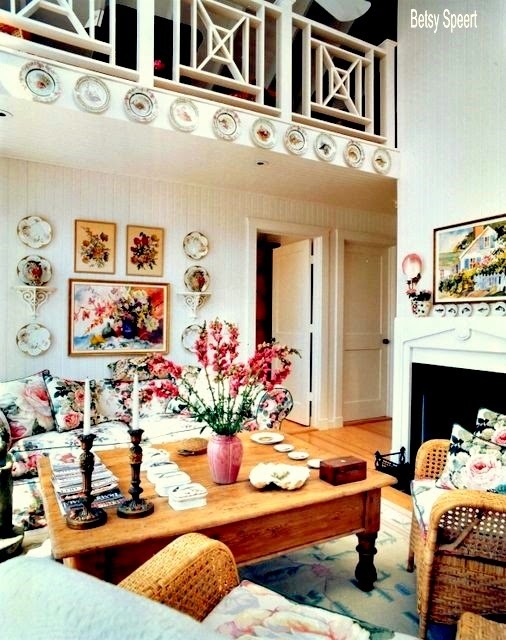 You can find these sets on eBay, though I found them antiquing, as there was no eBay when I designed this house. This Limoges set is currently for sale on the website, and I think it's very pretty. Here's a close up of the platter. another one in the other direction!!! I like the coral details. Limoges produced a lot of different sets of fish plates. I hung them on the loft fascia. I mixed together two different patterns. I still have some of these plates, and brought a set down to Flerida with me. I keep them in my kitchen, and will never use them, but it makes me feel all warm and gooey just knowing that I still have one set left. Too bad I don't have people over for dinner, but then I'd have to cook. Making a Little Room Feel Bigerer!!!! !